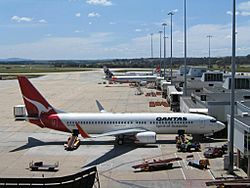 Melbourne Airport (IATA: MEL, ICAO: YMML) is the second busiest airport in Australia. It is the home base for Tiger Airways Australia and Jetstar. It is also the home base for cargo airlines Australian Air Express and Toll Priority. Qantas and Virgin Blue use it as a hub. Passenger data from paxstat. Australian Airlines aircraft at Melbourne Airport in 1988. A Skybus Super Shuttle travelling to Melbourne Airport. Melbourne Airport Facts for Kids. Kiddle Encyclopedia.